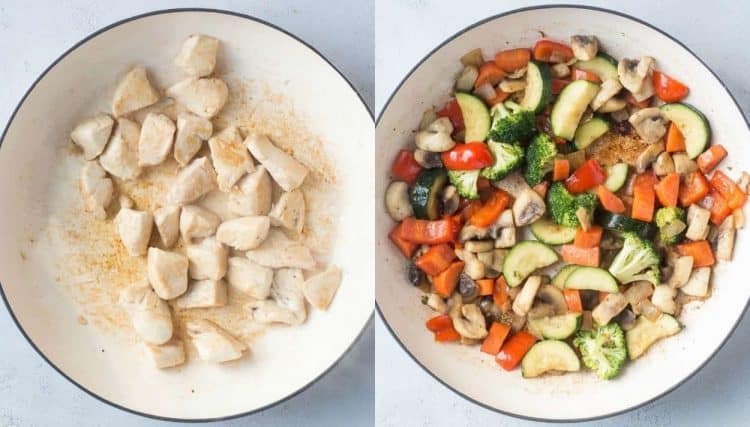 This easy Chicken Stir Fry recipe is amazing! Chicken with vegetables smothered in the most delicious garlic and ginger honey soy sauce. The stir fry is completely ready in 30-minutes, perfect for busy weekends. 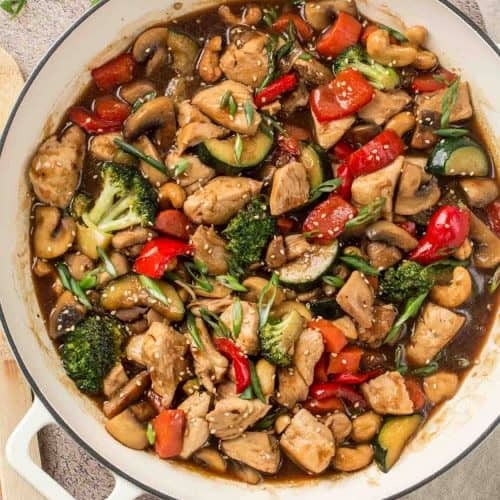 Also try our Vegetable Chicken Stir Fry or our Easy Spaghetti, quick one pan meals the whole family will enjoy, even the picky eaters will approve. 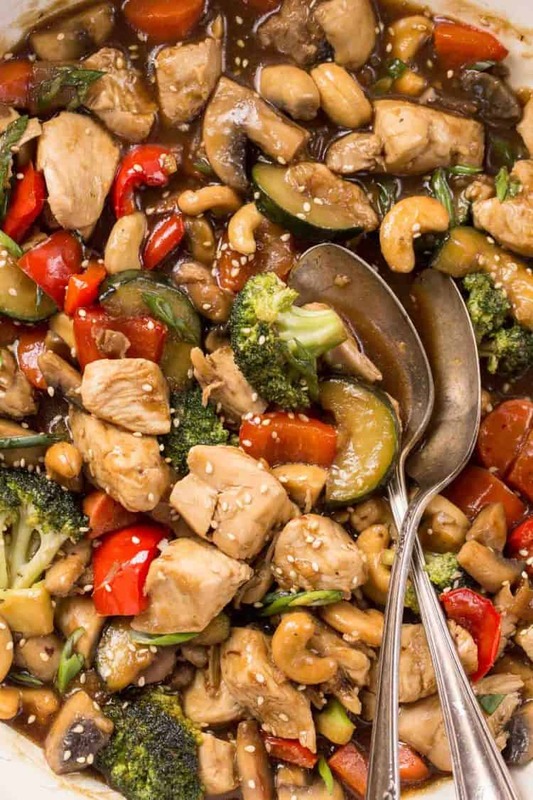 This simple chicken stir fry recipe is so much better than takeout! 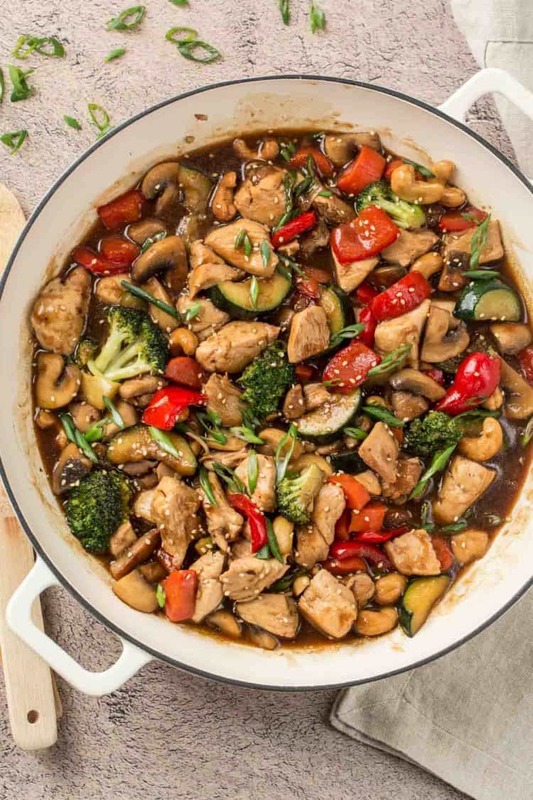 Chicken with vegetables combined in a really great honey soy sauce with the perfect addition of ginger and garlic. You just can’t go wrong with this recipe. If you prefer beef in stir fry, our Ground Beef Stir Fry recipe is a must try. Stir fry is always an easy dinner idea. You have the protein, veggies, and sauce all in one pan ready in under 30-minutes. 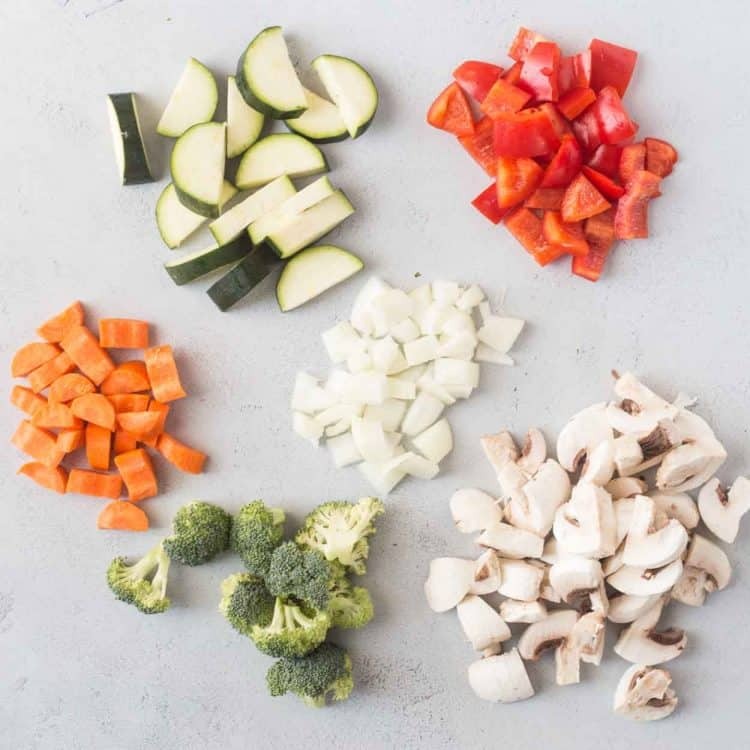 how to cut chicken and vegetables for stir fry? Cut the vegetables into even sized pieces. Try to keep them all uniform in size so they cook evenly. Cut the chicken into bite-sized pieces, about the same size as you cut the vegetables. Over medium heat, saute the chicken until fully cooked, stirring as needed. Remove from skillet. Add the vegetables to the same skillet and cook until desired tenderness is reached. The sauce can make or break a stir fry recipe. This stir fry sauce for this recipe is absolutely amazing! It’s not overly sweet or salty but the perfect balance of flavors and when combined with the ginger and garlic truly completes the recipe. 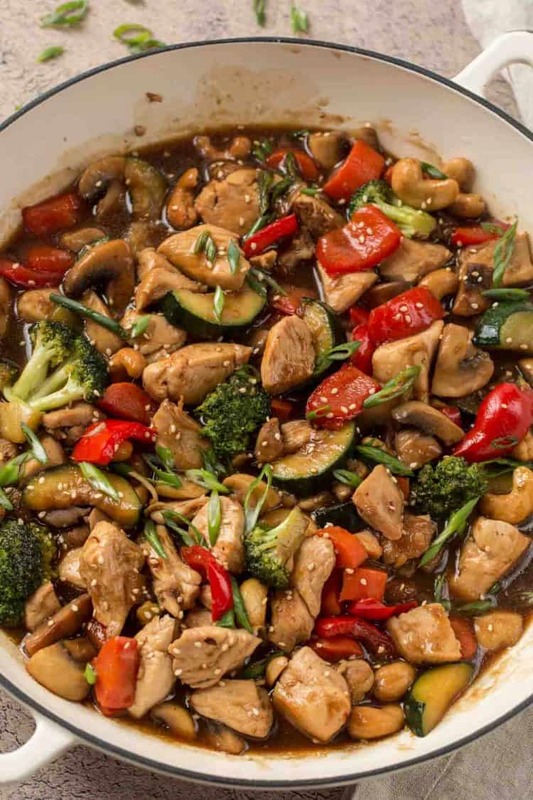 Though the chicken and vegetables are the main factors in a great recipe – a good stir fry sauce is just as crucial. In a small bowl combine the ingredients for the sauce. Stir together the broth, water, soy sauce, honey and cornstarch. Pour the sauce over the chicken and vegetable and stir to combine. Simmer until the sauce starts to thicken and serve. what’s the best chicken for easy stir fry? Though chicken thighs are more tender and perform better in chicken stir fry, but chicken breast may be used as well with great results. can vegetables be substituted in chicken stir fry? what do I serve chicken stir fry with? Since there’s already protein in the stir fry along with the vegetables, it’s a rather filling as satisfying dish as is. However, if a side is desired, baked white rice, or any pasta or noodles will all work great. If you like fried rice, make our fried rice recipe except skip adding the chicken since there’s already chicken in the stir fry. Yes, stir fry reheats great! Keep leftover stir fry covered, reheat over medium heat until chicken and vegetables are heated, or reheat in the microwave. Can you freeze chicken stir fry? Yes, stir fry may be frozen as long as no pasta has been added to the dish (pasta doesn’t freeze well). Transfer cooled stir fry to an airtight container and freeze. Thaw in refrigerator and reheat in a skillet or microwave. Baked Chicken Fajitas– easy peasy baked fajitas. Chicken Gyoza Recipe- restaurant dumplings at home. Chicken Quesadilla– Taco Bell CopyCat recipe. Creamy Chicken Casserole– always a hit at parties. Chicken and Shrimp Recipe– in a delicious wine sauce. I hope you give this kid-approved chicken stir fry recipe a try. It’s absolutely easy and so quick to make! This easy Chicken Stir Fry recipe is amazing! Chicken with vegetables smothered in the most delicious garlic and ginger honey soy sauce. So much better than takeout and ready in 30 minutes. In a bowl, combine all the ingredients for the stir fry sauce. Set aside. Trim the hicken thighs of excess fat and cut into bite-sized pieces, about 1/2" pieces. Cut the vegetables into even-sized pieces, keep them the same size as the chicken. In a large skillet, over med/high heat, heat 1 Tbsp oil. Once oil is hot, add chicken. Saute until chicken is browned, stirring as needed. Once cooked, remove chicken from pan, cover and set aside. Add the remaining oil and the butter to skillet. Add the zucchini, broccoli, onions, mushrooms, red peppers and carrots. Cook until vegetables are tender, stirring as needed. Return the chicken back to the pan. Add the garlic and ginger, cook 1 minute. Add the cashews and pour the sauce into the skillet bring to a soft boil. Turn the heat down and allow the stir fry to simmer until the sauce thickens and is well incorporated, stir often. Garnish with green onion and sesame seed before serving. NOTE: Recipe developed by Valentina’s Corner, and first published on Natasha’s Kitchen. I absolutely rely on easy stir frys for quick and more importantly healthy weeknight dinners. My kids never complain when it’s on the menu. I absolutely love this delicious recipe, Valentina! I make chicken stir-fry all the time. It’s such an easy and quick meal that everyone enjoys! And homemade is so much better than takeout. I love how you use honey instead of brown sugar here! So yummy! Dina, thank you! We love this Easy chicken stir fry recipe too! Wow, the glaze on that chicken stir fry is incredible. 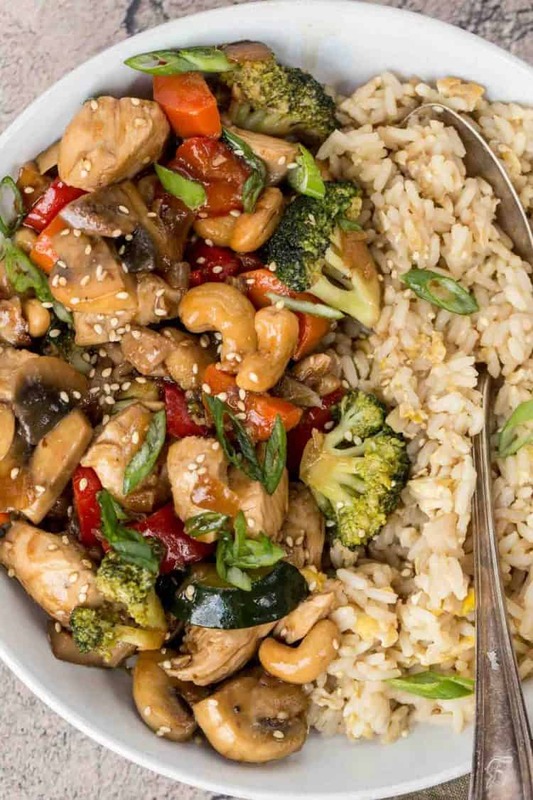 We love stir fry recipes and this chicken is a winner for sure! I’m always looking for easy chicken stir fry recipes! Excited to try this one. Do you think it can be made with frozen vegetables? I hope you love the chicken stir fry, Katie! It sure is a keeper easy recipe. 🙂 Yes, frozen vegetables will totally work. So flavorful and packed with nutrition, thanks for sharing! Never thought to add zucchini to stir fry. This looks awesome. Can’t wait to try the recipe. This is SO delicious what a great recipe! Thanks for the feedback, Beth. I’m so glad you enjoyed the stir fry. I love easy dinners like this! Thanks for a great recipe! That’s wonderful, Lauren! I hope it will become a family favorite. We love a good stir fry! Such a great weeknight meal! This chicken stir fry really is the perfect weeknight meal. Seriously craving this stir fry! One of my all-time favorite meals. Thanks, Sommer! I’m so glad you enjoyed the chicken stir fry. Makes me so happy. The recipe brought water to my mouth. I really want to try it. Would it be okay to serve it with traditionally cooked rice? Yes, plain rice would be great as the sauce will add flavor to it. 🙂 Enjoy, Gabi! !